Living in a cottage (the Casita del Lago) in the middle of a UNESCO designated biosphere, fire has always been one of my biggest fears. I’m not so concerned about the danger to myself as the Casita is lakefront and so in the event of a blaze my plan of escape mainly consists of grabbing 50 Shades the cat, leaping into one of the kayaks and paddling madly away from any blaze. 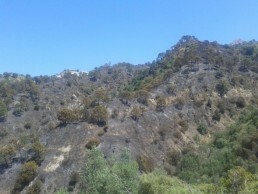 But earlier this summer my worst fears came true when fire struck the hills.